Memorial Day marks the unofficial start of summer, and you know what that means … bathing suit season! Although a day at the beach sounds heavenly to most of us, a day at the store shopping for a bathing suit sounds quite the opposite. I have found that my post baby body is much different than my body before … even though I am back to my pre-baby weight, “things” don’t sit in all the same places. I am still breastfeeding, which means I am two sizes bigger in the chest than I normally am. So this season I have been looking for suits that downplay that area. I think it’s so easy to get tricked by seeing a bathing suit on a clothes rack or mannequin or in a photo that looks great. However, it may not flatter your shape once you try it on. That is why it is key to figure out what your body type is and what suit flatters your shape. If you have parts of your body that you want to emphasize or minimize, the right bathing suit tailored to your body shape will do the trick. I knew I wanted to downplay my chest area, so I was looking for more coverage. I found exactly what I was looking for at Target with their amazing selection of swimwear. This bandeau bikini provided me with the coverage I was looking for. I love the cut-out details on the top and it has attached straps if I need more support. Next, I wanted to find a comfortable outfit I could wear over my swimsuit. I tend to find myself headed straight from pool to grabbing a bite to eat or cocktails. I found these adorable wide-leg print pants that feel like pajama pants they are so comfortable and they paired perfectly over my suit. I also found this off-the-shoulder top (only $20) to pair with the pants. 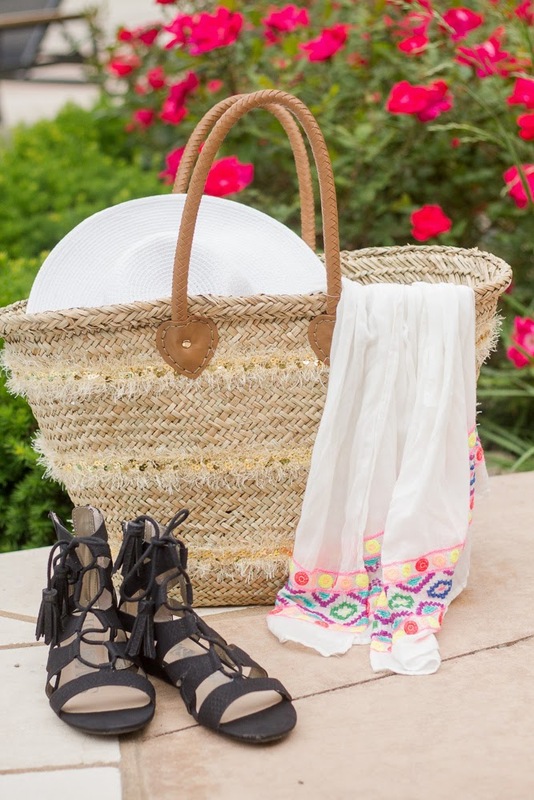 Lastly, I LOVE this straw beach bag. It is so cute and it fits everything you need for a day at the pool. I love the fact that Target can be my one stop shop for the swim season. It really makes swim shopping simple and fun! Being confident in what your wear, that is what matters most! Don’t dread bathing suit season, embrace it! Below are some of my favorite swimsuits currently at Target. These are all so cute! Target always comes through for something budget friendly and fabulous! I love that bathing suit! Cute look! Such a great suit—you look amazing! I love bathing suits, but they are such a pain to go to the store to try on. I usually just order a bunch online then try them on at home! I totally agree that it's all about feeling confident in your swimwear—or anything for that matter! Thanks, Brooke! I like the way you think! I do that with clothes often, no time to shop w baby! You look incredible!! Share your workout/ nutrition secrets because you look amazing! I love those wide legs pants as a cover up- super cute! aw well thank you!! (made my day!) I am sharing my fitness here soon! Thanks for stopping by, Chelsea! I love the look of those wide loose pants you're wearing in the first photo, but they are always sooo long on my short little legs. boo! But I do love me a good target swim suit. Especially for something trendy that I won't wear more than a year. They do it right! That happens to me too with wide leg pants. These finally fit right! So very true! I have been impressed every time I browse, which is like every week! Have a great weekend, darling!